Thanks for visiting us at Emu Logic, we would like to tell you a little about ourselves and our emu farm. We love regional Australia and live on our emu farm near the Warrumbungle National Park north of Dubbo, between Gilgandra and Coonabarabran in North Western NSW. We’re a family business and there are six of us – Penny and Phil, with our two children Daniel and daughter-law Deb, Nicole and son in-law Dan who all have some part in the running of emu logic. We have farmed emus for around 20 years, raising from 100 to 500 chicks per year and we currently have about 800 birds on our emu farm. All of our chicks are incubated and hand raised except a few for filming. 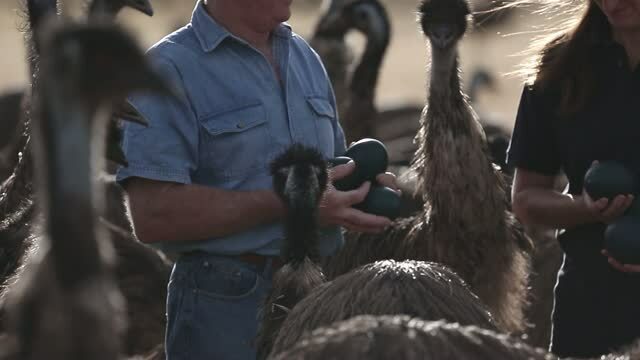 Over the years we have learnt a lot about farming emus and we can certainly say that we are highly experienced and very knowledgeable in the raising of emus and the production of quality emu oil, feathers, meat and eggs. Being on the road into the Warrumbungle National Park from Tooraweenah means that we always have people dropping in and asking about our emu farm. It has become so popular that we now offer tours and have our emu farm shop open. We are a true working emu farm so the times do change with the seasons and work on the farm . If your passing by and the open sign is out do drop in if looking ahead to a visit to the emu farm shop check the home page for hours or contact us. If your interested in a tour, book ahead as we can not guarantee availability with out notice. We are also very active in the industry, with Phil being President of the NSW Emu Association when it was operative. As one of a few emu farms in NSW we are frequently contacted by the media and we have all done ABC radio interviews, with the last still being on the ABC website. A number of articles have been published on us, our emu farm and the emu industry. We have in the past attend the Tocal fielddays , Pimex fieddays and Mudgee field days with our emu oil and emu feather products. We are also available for public speaking engagements on having an emu farm and why we do it. Television has also shown a keen interest in our emu farm with Bushwacked, Australasia with the BBC, Sydney weekender, Travel Oz , a Japanese TV show with Ito Asako from Itte Q.T.V. and various documentaries on emus. We have also had a short film done on the Emu Wars and a low budget movie partly filmed on our farm. Other interesting times have been with movies like Heavens Above and researches into Emu behavior, genetics and the latest is working with Australian Botanic Gardens Mount Annan seed bank in the germination of rare plant species by passing them through emus. We not only a emu farm we have quite a variety of other animals on our 1,300 acres of land, including, sheep, cattle, goats and poultry. Along with a healthy population of native wildlife.